As time ticks off on Thanksgiving 2014, I can reflect and be thankful for many things this last weekend of November. Yes, there’s health, family, work and our home. But thanks to our brave new digital world, I have friends beyond those who I’ve met in person and enjoyed time in each others presence. 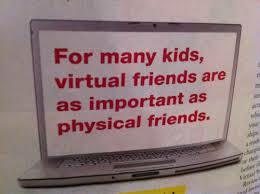 I’m referring to virtual friends. Hey, for many of us adults, virtual friends also are important. I trust those of us who have embraced digital communications have “friends” or people (hopefully not robots) they communicate with regularly. These virtual friends — rest assured I won’t try to fabricate and use some silly made up word like “virtuends” — can be f0ound through social media or perhaps through a common interest. Here are two of my virtual friends. I’ll just use their first names to protect their privacy. Debbie, who’s retired, loves football and starts most days with an uplifting Facebook post. She also is fond of a gourmet blend of coffee, participates in an online radio show and is always quick to respond to my Facebook commentary with a positive message. How we became virtual friends: Through a now defunct social media site. 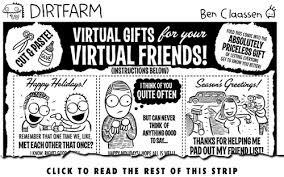 Wonder what my virtual friends would like for the holidays? successful one. She’s earned industry honors, writes fiction, manages on of the most popular communications blogs and is a leader within her market. I’ve been honored to serve as a an unpaid “consultant” for one of Elena’s recent works of fiction. How we became virtual friends: I contributed content to Elena’s blog. Things can be fleeting in life, especially in the virtual world. But I hope my virtual friends will be around for a long, long time. Better yet, I hope someday we’ll get to be friends the old-fashioned way — in person. This entry was posted in Uncategorized and tagged Facebook, friends, online friends, thanks, Thanksgiving, Virtual friends. Bookmark the permalink.